Audio Video Interleave (also Audio Video Interleaved) is a multimedia container format and was first released by Microsoft in November 1992. AVI files can contain both audio and video data within the space of a single file that can be a synchronized playback of both audio and video. This format was part of a larger package which was called "Video for Windows". AVI format is quite popular in Windows world and sometimes users need to convert avi to mp4 for Mac platforms. Why change AVI Video to MP4 on Mac? As is mentioned above, AVI is generally supported by Windows. For Mac users wishing to play AVI files on Mac, Apple related media player, gadget, etc, things gonna be different. Despite AVI joins Apple's iPod, iPad, iPhone supported format list, this AVI format is only readable when it is encoded with Motion JPEG. In this case, you can convert AVI to MP4 on Mac for a change. MP4 is a shortened term for MPEG-4 Part 14. MP4 works by compressing the files, making the overall size much smaller with extremely high quality, as crisp and clear as that of a DVD, thus making it even more widely used. People loved to backup their cherished videos as MP4 files. The MP4 container format is also used by iTunes, and compatible with iPad Air 2, iPad Mini 4 with Retina, iPod, iPhone X, iMovie, Final Cut Pro, Play Station Potable (PSP). If you have saved TV shows, movies in AVI format, or some AVI clips from your camcorders on your Mac computer, but want to play AVI files on Mac, enjoy AVI videos on iOS devices, edit AVI clips with your iMovie, etc, to free convert AVI to MP4 on Mac is definitely a trustworthy process. 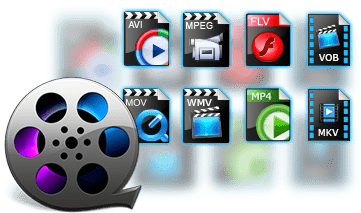 Generally, your AVI media file to MP4 conversion on Mac computer can be done with the assistance of a Mac media converter. MacX Video Converter Pro is designed specifically for Mac platforms (macOS Mojave) to convert AVI to MP4 on Mac or other video formats like FLV, WMV, MTS, M2TS, MOV, MPEG, MKV etc with No.1 fast speed and high video quality. The guide below will show how to decode AVI codec to MP4 on Mac at highest quality. After free downloading the top video processing software on macOS (also for Windows version), launch it. Then click "Add File" and locate AVI files. Click the "Browse" to select a folder where you want to place your MP4 files. Click the "RUN" button to start to convert video to MP4 on Mac, you could view the conversion progress and cancel the process at anytime. Note to check the box of hardware encoder to take use of the Intel's QSV/Nvidia/AMD HW acceleration tech, with which the whole converting will be boosted to world's fastest. 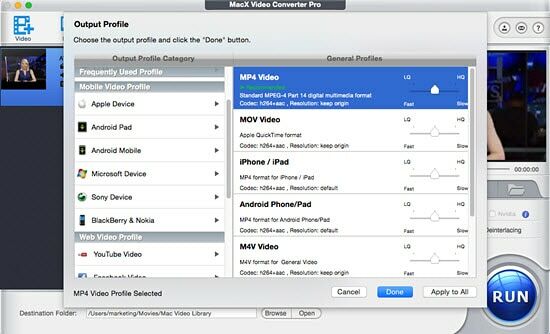 There are lots of other formats which can be changed by using AVI to MP4 converter for Mac. Specifically, it owns powerful capabilities to transcode MP4 to AVI, MKV to MP4, FLV to AVI, AVCHD to MP4, H265 to H264, etc. to Mac computer, iMovie, iTunes, iPhone X/8/7, iPad Pro, iPad Mini 4 with Retina, iPad Air 2, iPod touch 5, Apple TV 4, PS4, Android, Galaxy S8 edge, Google new Nexus, etc. with 410+ preset profiles offered.